Visa-exempt foreign nationals : Benin, Burkina Faso, Cape Verde, Central African Republic, Chad, Congo, Gambia, Ghana, Guinea, Guinea-Bissau, Liberia, Mali, Mauritania, Morocco, Niger, Nigeria, Senegal, Seychelles, Sierra Leone, Togo and Tunisia. Note: a passenger who does not have Ivorian identity papers (passport or identity card) is considered as a foreign passenger even if he / she has a multi-citizenship and must therefore be in possession of a visa . E-Visa online procedure : it is the simplest and the fastest way to get your visa. Citizens of the eligible nationalities (see above) can, within a few minutes, complete their application and pay their visa fees on the dedicated website. Only standard single entry visas are eligible for e-visa. With your scanned photo, your passport and your credit card you can obtain your visa by clicking here (despite its archaic and amateur appearance, this is the official website of visa issuance. No other website and no other way of obtaining is allowed). The e-visa procedure is quite complicated and happens in two stages. At first, the payment of the visa (73€) shall be made on the dedicated website (http://snedai.com/e-visa/). A number of information must be provided at this time online. Once your confirmation mail received, you must print it. 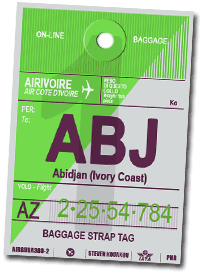 This document will be asked when your arrive at Abidjan Airport where your biometric visa will be delivered. WARNING : you must ask your e-visa at least 48h before take off. Standard procedure in embassies: if you are not eligible for the e-Visa or if the type of visa you wish can not be obtained through the e-Visa procedure, you can go to the nearest Ivorian Embassy (see locations on the SNEDAI website) with the required documents they asked you to bring. * Updated to July 2017. Conditions for obtaining visas, their rates and the nationalities concerned change regularly according to the diplomatic news. Please check systematically what formalities you are subject to.